Hi, stampers! It's Ann, thanking everyone who participated in my sketch challenge this week. There were so many wonderful entries. The task of narrowing it down to a single card was difficult, but it was one in which I took delight. Before we get to my choice for Headliner, let's see what caught the eye of the Design Team this week. Amy's card is breathtakingly beautiful! The floral focal point is colored to perfection with a trio of colors that work so well together. With its subtle background and simple embellishments, it maintains a clean look. This card is perfect in every way...and made this Layer Lover's heart go pitty- pat! Congratulations Amy on being my choice for Headliner this week! Thank you again to everyone for playing along with us. Congratulations to all our winners, please pick up your badges here. 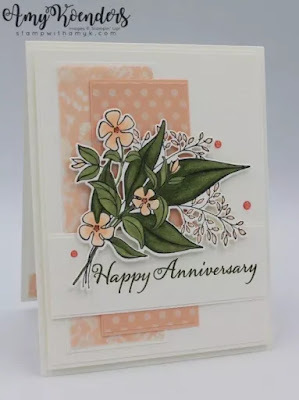 Please come back tomorrow for a pretty Theme Challenge from Anne Marie. Congrats to all, especially Amy! Congrats to all ! Simply wonderful cards! Congrats to all! And thank you so much Joanne für choosing my card! It was such a surprise and I am really happy about being mentionend!